West Maui’s Hidden Beachfront Gem – Puunoa Beach Estates #205 – Luxurious 3BR Villa w/ Stunning Ocean Views! Enjoy an effortless Maui vacation in the heart of it all, but away from the crowds, at this private gated beachfront oasis. This 3br/2ba villa boasts one of the best locations on the island and has everything you need for the ultimate Maui experience. Maui Resort Rentals is proud to present this luxurious 3 bedroom oceanfront villa at the exclusive Puunoa Beach Estates gated community on Lahaina’s gorgeous Baby Beach. Get away from the crowds at this tranquil gated community located steps from the sand on Lahaina’s legendary “Baby Beach.” This hidden beachfront gem features a lush peaceful setting, yet is only 5 minutes away from all the shops and restaurants of Maui’s world-famous Front Street. For tranquility and convenience, the Puunoa Beach Estates is truly second-to-none. The incredible beachfront vantage point delivers sweeping ocean views, breathtaking vistas of Maui’s neighbor islands, and dramatic West Maui sunsets. Your group will have plenty of space to gather and reconnect because the newly remodeled Villa 205 offers an expansive 1750 sq ft of interior living area with 2 full size bedrooms and 2 full bathrooms. Each full size bedroom offers a sumptuous king-size bed. In addition, a converted den can be closed off to offer a small 3rd bedroom with a queen bed – well suited to one adult or two small children. This brings the total guest capacity to 5 adults, or 4 adults + 2 children. The 3 bedrooms are complemented by 2 full bathrooms. Each bathroom features a glass and travertine walk-in shower and the master bath comes with its own oversized soaking tub. Prepare meals or refreshments in the full kitchen with all the necessary cookware, appliances, and utensils. This villa has everything you could possibly need to make this your special Maui home-away-from-home. Consider packing lighter because the condo is equipped with a washer/dryer. Free high-speed wi-fi is also available for your convenience. 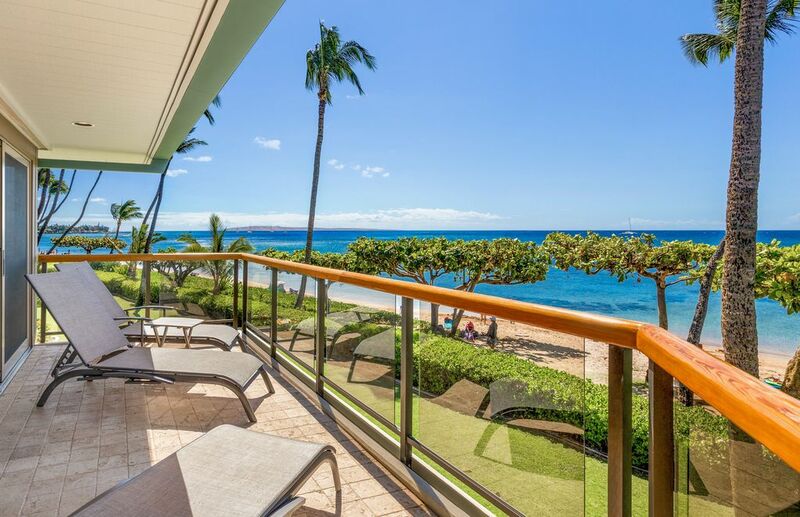 Step outside onto the large lanai (balcony) and enjoy those breathtaking oceanfront views and dramatic West Maui sunsets. During whale season (Dec 15 - May 15) you may even witness Maui’s seasonal visitors, the humpback whales, frolicking just offshore. The villa is appointed in a tasteful island-themed decor. Rich koa wood cabinetry and elegant travertine add a luxurious touch to the interior. Vaulted ceilings help to create an expansive feel to the living area. When it is time for the beach, there is no need to hop in the car because one of Maui’s favorite beaches, “Baby Beach,” is right in front of the villa. The calm, warm waters of Baby Beach are protected from the powerful waves that wash up on the shores of most Maui beaches. This is the perfect beach for families with children. If you like to snorkel it doesn’t get much more convenient, because you can walk 3 minutes to Snorkel Bobs to rent your gear, and then head out right in front of the villa to check out the colorful reef fish and green sea turtles. The beach offers plenty of spots for both sun and shade and the villa is well stocked with beach chairs, beach towels, and beach umbrellas. After you are done spending another perfect day lazing about on the soft sands of the beach right in front of the condo, or playing in the warm and protected waters, perhaps you will want to wind down with a dip at the private pool. This boutique property only has 10 total villas, so there is no need to jockey for a pool chair here! You may also wish to relax in the jacuzzi amidst the lush tropical foliage of the property’s impeccably maintained grounds. Additional property amenities include a sauna and a modern fitness center. For convenience it simply doesn’t get any better because this villa enjoys a prime location in the heart of Maui’s famous Lahaina Town. Leave the car parked at the condo in the free secure parking area and head south a mere two blocks to experience the shops, restaurants, and galleries of Lahaina’s world famous Front Street. Or head north 2 blocks to visit Safeway, the Lahaina Cannery Mall, or West Maui’s acclaimed Mala Ocean Tavern. The location also offers easy access to all of West Maui’s popular activities including parasailing and whale watching in-season, snorkeling, dinner cruises, jet skiing, sport fishing, surfing, ziplining, and horseback riding. In addition, the Puunoa Beach Estates is perhaps the only community on Maui within walking distance of Maui’s award-winning Old Lahaina Luau (please book well in advance). If during your stay you require assistance or advice about the surrounding area or the town home, rest assured that you’ll be swiftly taken care of with aloha by one of our friendly & knowledgeable liaisons. After all, we are located only a few miles north of the Puunoa Beach Estates. For guests looking for the spaciousness of a luxury villa, a prime beachfront location, and a private relaxed atmosphere, the Puunoa Beachfront Estates delivers the perfect Maui vacation retreat. We look forward to welcoming you to Puunoa Beach Estates Villa #205 and are grateful for the opportunity to 'Make Maui Reality' for you. As local luxury vacation rental experts, Maui Resort Rentals is perfectly poised to assist in providing you with an unsurpassed Maui experience. All of our rentals are expertly cared for and undergo a rigorous five-phase cleaning process before every check-in, and our Ritz-Carlton and Marriott trained staff are dedicated to providing you with the highest level of customer service. With staff available 24/7 and a 10 minute response time guarantee, you can be rest assured that your comfort is our highest priority. A commitment to excellence has fostered the growth that has recently earned us recognition from the Pacific Business News as the fastest growing vacation rental company in the state of Hawaii. For us, the only thing better than calling Maui home is the privilege of sharing it, so let us help you make your Maui vacation dream a reality. The Puunoa Beach Estates community is centrally located right on the beach in the heart of Lahiana Town, within two short blocks of Maui's world-famous Front Street. The magical backdrop of the Pacific Ocean and Maui’s neighbor islands of Lanai and Molokai deliver some of the most breathtaking sunsets you are ever likely to witness. Whales can be seen splashing off the coast in the winter and the summer gives way to Maui’s only spots for parasailing and jet-skiing. In addition, the limited number of residences at this small boutique resort creates helps to calm the atmosphere, making it the perfect retreat for a relaxing Maui vacation. This 3 bedroom oceanfront gem is located in the exclusive Puunoa Beach Estates gated community on Lahaina's popular Baby Beach. Enjoy a prime location with plenty of privacy in this luxurious tropical enclave. We had the most relaxing on the beach, and also playing at the pool with friends we met while there. A short 5 minutes (or so) walk and you are at all the restaurants and shops! We will definitely be back! Condo was clean and well furnished! End unit, nice beach which is protected from the winds, we went during a low peak time and the beach & town was not crowded at all. Nice bbqs by the pool. Convienent location. Thank you. Fantastic property in perfect location! This 3 bedroom property is exactly as pictured and described - spacious, attractively furnished including comfortable beds, quality linens, ample kitchen equipment & dinner/serveware, plus everything you need for the beach (towels, umbrella, 5 Tommy Bahama chairs, cooler and some masks/snorkels/fins). Large deck with comfy furniture for reading & watching sunsets, plus direct access to Baby Beach for swimming, snorkeling and beach combing. The reef- protected beach had very minimal waves, so was the perfect place for my 10 year old neice to learn to snorkel, and there were enough fish to make it interesting (plus the occasional sea turtle poking its head out of the water!). The management service was excellent throughout the reservation process - Nicole responded promplty to questions about the unit/items provided and to confirm the status of the property prior to our arrival, and the staff member who greeted us at check in showed us everything we needed efficiently so we could relax after our travel day (I wish I could remember his name). We didn't realize there was no beach cooler till about 30 minutes after he left, but he was willing to get one from storage and bring it to the unit right away if needed, which is impressive since we arrived on Sunday afternoon. We didn't need it till Tuesday, and it was delivered on Monday as promised. The unit was exceptionally clean and ready for us, plus they were able to accomodate an earlier arrival time. I wish the smaller unit we rented in Kihei (after extended family departed) had the same level of management service before and during our trip! The property was very nice but surrounding area a bit sketchy. We loved this unit. We have stayed at Pu'unoa Estates several times and this unit ranks at the top. Clean and stocked full of amenities! Additionally, the management company (Maui Resort Rentals) is quite possibly the most accommodating management company we've ever dealt with. My wife and I went with her parents and our two small children, and the condo was perfect. Big enough you didn't feel cramped at all. And it is right on "baby beach", which is a great beach for snorkling and wading with small kids. Its walkable to the Lahaina shopping district and Mala Pier.